This is a variation of the same mindless game you played as a kid played on a blackjack size table with a six deck shoe. The player and the dealer each get one card. If the player's card beats the dealer's card then the player wins even money. If the dealer's card beats the player's card the player loses. In the event that both cards are of equal value then the player may either forfeit half his bet or go to "war." 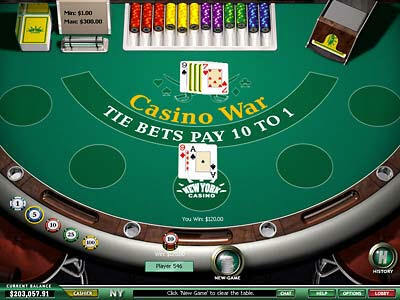 If the player elects to go to war then he must double his bet, the dealer then burns three cards before giving both the player and himself a second card. If the player's second card either beats or ties the dealer's second card then the player wins even money on the raise and the original wager is a push. If the dealer's second card beats the player's second card the player loses both his original and the additional wager. There is also a side bet available that the two original cards will tie, which pays 10:1. If the player goes to war on ties the house edge is 2.88%. If the player forfeits on ties the house advantage is 3.70%. The house advantage on the tie bet is 18.65% (ouch!). The standard deviation in casino war is 1.05%.